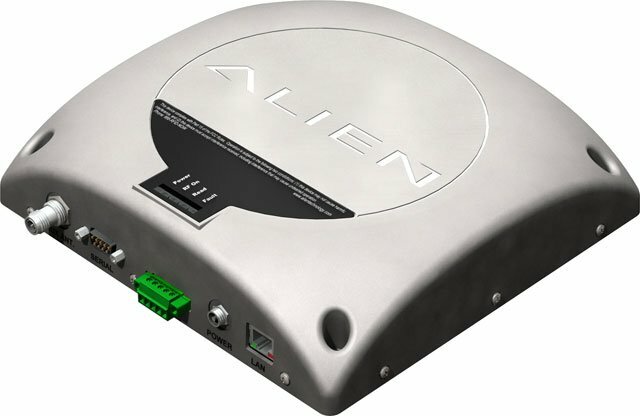 Alien ALR9650 - RFID Reader, UHF, Fixed, 2-Port Capacity, Integrated Antenna, GPIO, 64MB RAM. Includes RFID Reader, PoE Power supply, and Standard Network Cable to Connect to Power supply. The Alien ALR9650 is the ideal solution for single and two-antenna applications. The reader electronics and a high-quality, circularly polarized antenna reside in a single package, eliminating external antenna cables, resulting in the simplest and least expensive installation. A second antenna port enables 2-antenna applications on the ALR9650. The Alien ALR9650 has POE capability, allowing power to be delivered over properly-equipped local area networks, eliminating expensive AC wiring. (Where no AC power is available, a standard AC/DC power converter is provided.) With the added cost savings due to the elimination of the external cabling, the ALR9650 significantly reduces the cost and complexity of installing an RFID read point. The Alien ALR-9650 is also known as Alien Technology	ALN-ALR-9650	or ALR9650	.